Teams on the rise, teams in a little bit of trouble, and teams that we haven’t totally figured out yet will all be in attendance. So there’s plenty of storylines to follow this weekend, from individual squads to the overall bid watch. Here are the stories I’m most looking forward to seeing unfold. Can Phoenix Build on Strong Showing at PEC? #7 Raleigh Phoenix surprised many with their impressive showing at Pro-Elite Challenge. They were the second lowest seeded team in the tournament after missing Nationals in 2017, but made it all the way to semis without losing a game. They suffered heavy losses in semis and the third place game, but very few would have predicted them to do as well as they did. They’ll of course be looking to build on the back of that performance, but with a changed perception, they’ll have different challenges to face this weekend. Now the top seed, Phoenix won’t have the luxury of coming in under the radar. Based on their results to this point, Phoenix sits in a pretty comfortable 9th place in the rankings. But this weekend shouldn’t be about hanging onto a bid for them. Phoenix showed at PEC that they not only have eyes on returning to Nationals this year, but making a run in the bracket as well. This is their last tournament before the series, and their last regular season chance to prove who they are to themselves and the rest of the division. For #5 Toronto 6ixers, Elite-Select Challenge represents their first real action of the USAU season. They have just one lone result from New York Warm Up, a 15-2 win over Philadelphia Green Means Go. Currently they’re sitting tied for 24th in the rankings, and while no one should expect them to stay outside of the bid cutoff, it does add a bit of pressure to their weekend. 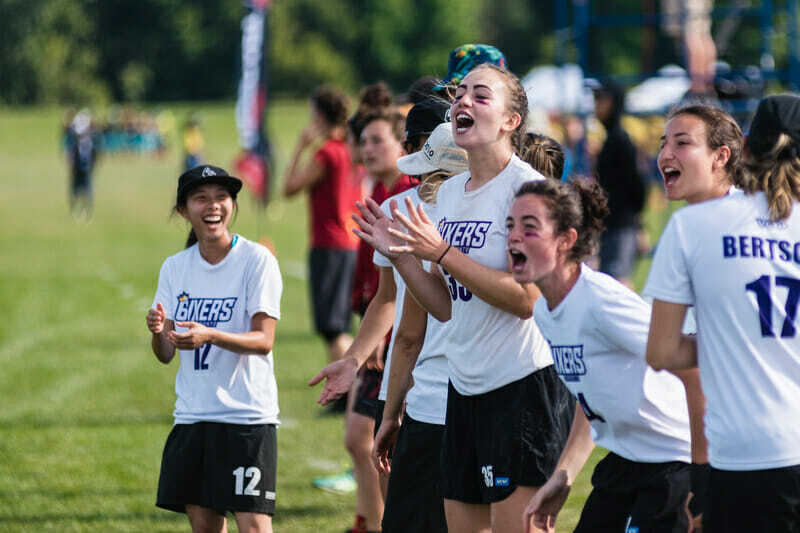 They impressed at the World Ultimate Club Championships back in July by making quarterfinals and nearly knocking off #1 Boston Brute Squad in power pools. But in addition to the pressure of needing results this weekend, they’ll have to get them with an understaffed roster. Star handler Lauren Kimura and star cutter Sarah Bobak will not be present, nor will two of the team’s top D-liners in Brittney Dos Santos and Molly Lewis. Naomi Redmond, a solid role player who likely would have helped with the absences of Dos Santos and Lewis, won’t make the trip either. Even with all of the absences, 6ixers are still contenders to win the tournament, and may even be the front runners. But they’re entering their first major tournament of the TCT season far from full strength. The other two top seeds, #13 Chicago Nemesis and #10 Madison Heist, are teams whose seasons are in different points of progression. Nemesis is hot off an impressive showing at the U.S. Open earlier this month. Their 3-4 record doesn’t exactly jump off the page, but two of those defeats came to Brute Squad and Atlanta Ozone, and the other two were by a combined three points. It was their consolation, rematch win over Ozone that made the weekend feel like a positive for the Chicago club. Nemesis are also the defending champions of the tournament, and the only team to have won the tournament twice. They have a tough pool, with #15 Portland Schwa and #20 Seattle Underground both also in Pool B, so their tournament title defense won’t get off to an easy start. But Nemesis can take comfort in the fact that they’ve not lost to any teams ranked lower than them in the power rankings, as well as already having beaten Underground once this season. Heist, on the other hand, haven’t played at a major tournament since Pro-Elite Challenge. They played at Heavyweights two weeks ago and steamrolled the competition there. But the last time we say them play teams of the caliber they’ll face in Columbus, they put together an inconsistent tournament. Robyn Wiseman put up a jawdropping 26 assists that weekend, but Heist will be looking to have a stronger performance as a whole. Their pool play game with #12 Texas Showdown will be one to watch. If Heist comes out on top in that game, they’ll likely win the pool and give themselves their best chance at going deep into the weekend. For much of the rest of the field, the big picture will likely take a back seat to game to game results. Heist, Showdown, Schwa, #14 Columbus Rival, #17 San Diego Wildfire, and #23 Kansas City Wicked all sit 50 points or less above 16th place right now. With 6ixers presumably taking one of those top 16 spots come the end of the year, the fight to stay above that cut off will be an intense one. The rest of the field have some catching up to do. Underground, #16 Minneapolis Pop, #18 Boston Siege, and #19 New York BENT are the biggest names currently outside of the bid cutoff, but #25 Colorado Small Batch is in the conversation too, sitting just two places (albeit 70+ points) behind Pop in the rankings. Even with many of these teams so close to each other in the rankings, many of their seasons feel pretty different at this stage. Showdown had a solid tournament at U.S. Open, while Rival had a nightmare of a weekend, going winless in pool play before a pair of consolation victories. Schwa and Wildfire had just two wins each at Pro-Elite Challenge, while Wicked is undefeated through two tournaments against less stiff competition. Underground and Pop were both Nationals attendees last year and will be disappointed that they’re on the outside looking in at the moment, while BENT, Siege, and Small Batch’s hopes may have been to simply still be in the picture at this stage. For all of these teams, a big or disastrous weekend could swing their seasons one way or the other. And for some, a couple of points here and there could be the difference between making Nationals and missing out. We’re getting to the stage of the season where chances to make big moves in the rankings are limited and this will be the last real chance for many of them to earn their own bid to Nationals. Stealing a bid is harder in some regions than in others, but all of these teams would certainly prefer to have an extra bid to work with come Regionals. Comments on "Elite-Select Challenge 2018: Tournament Preview (Women’s)"